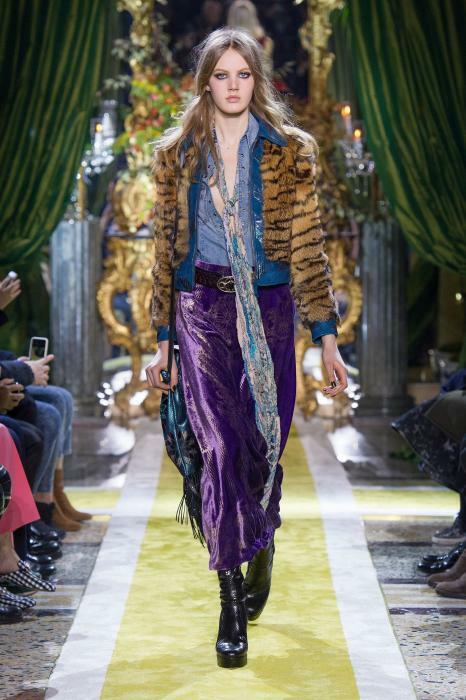 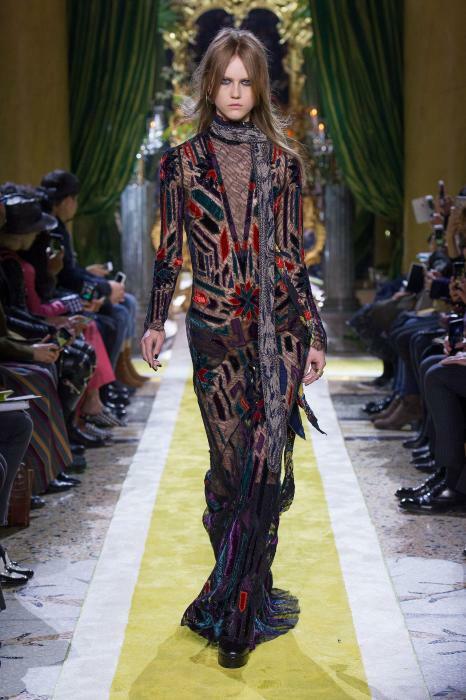 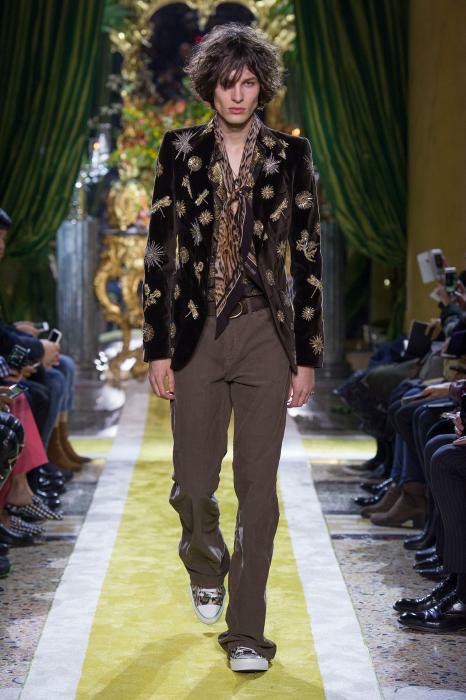 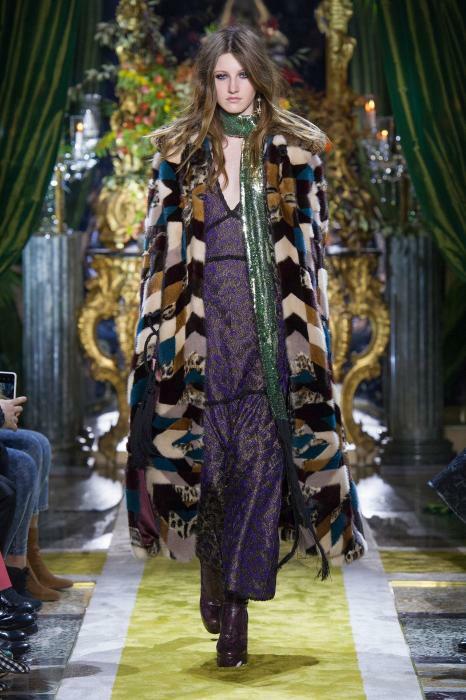 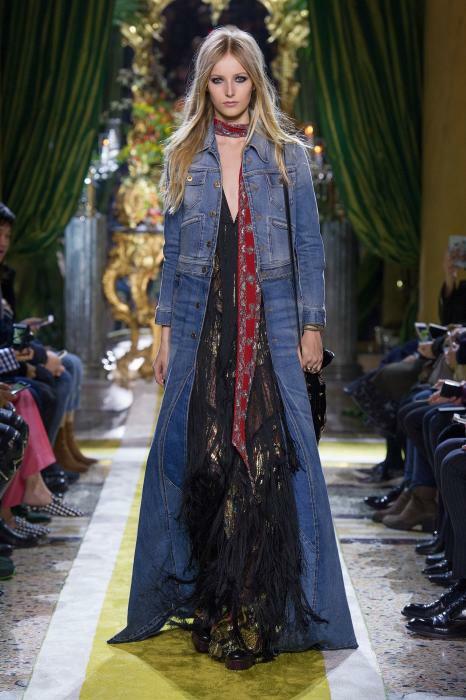 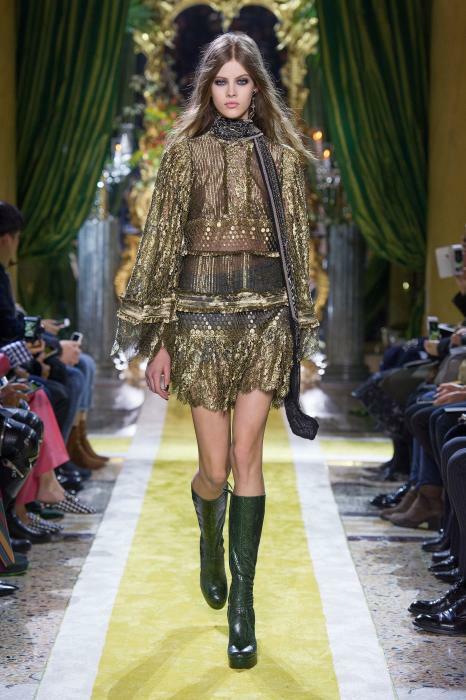 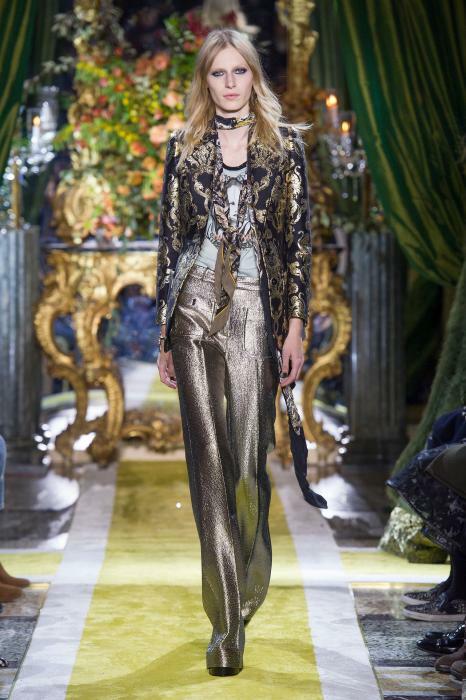 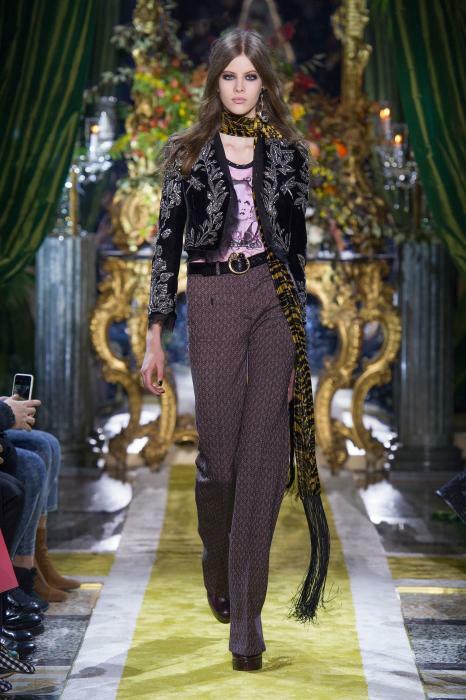 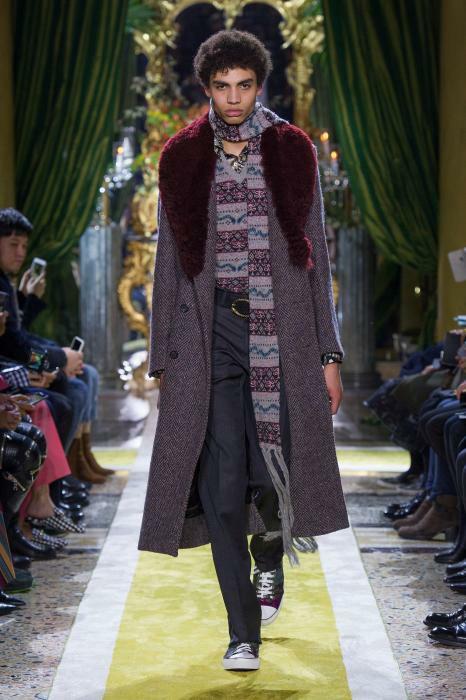 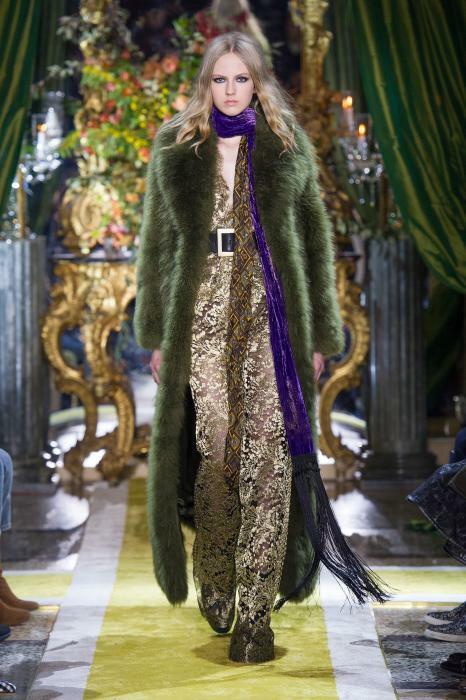 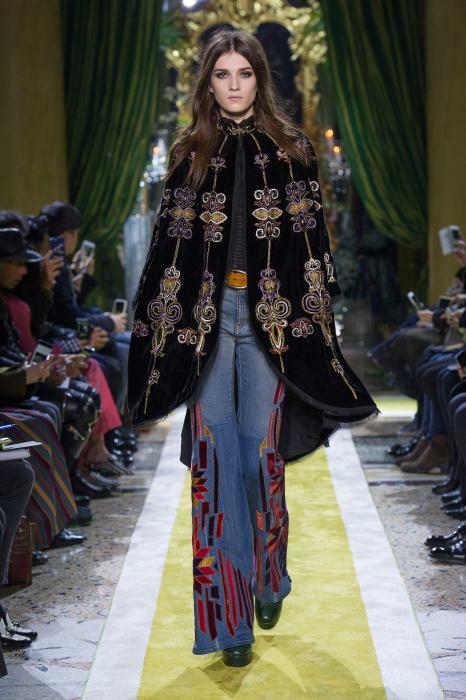 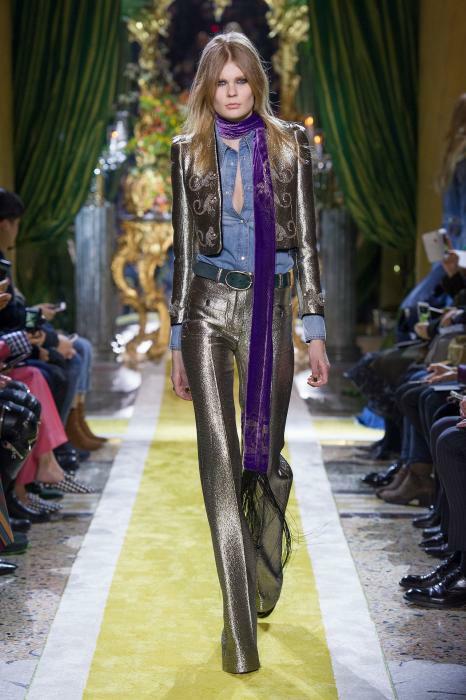 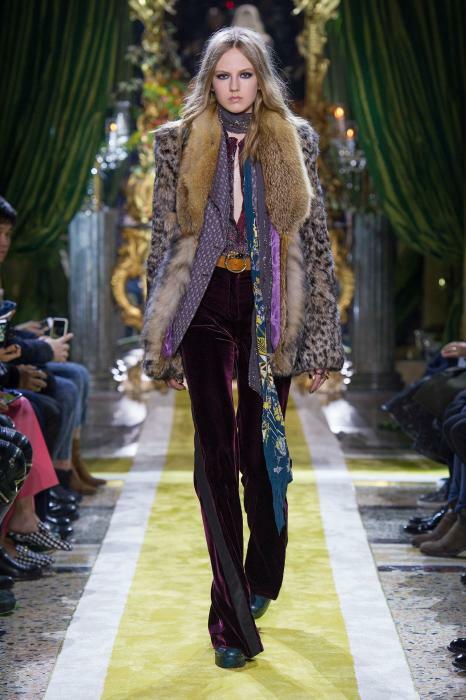 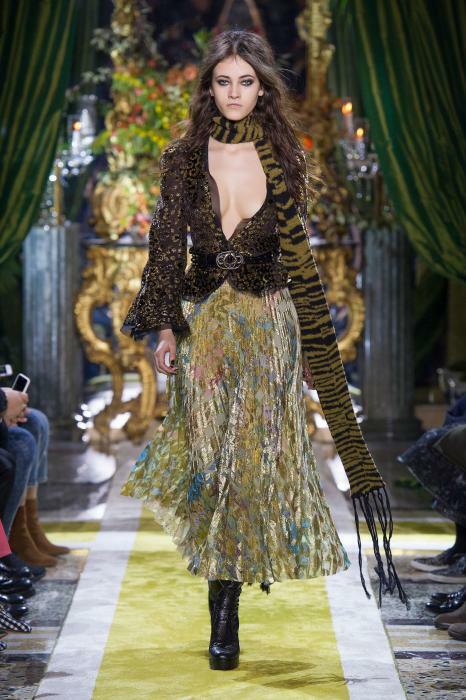 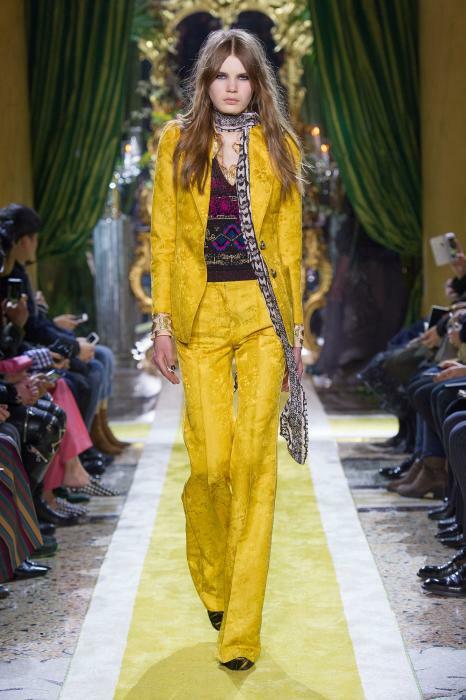 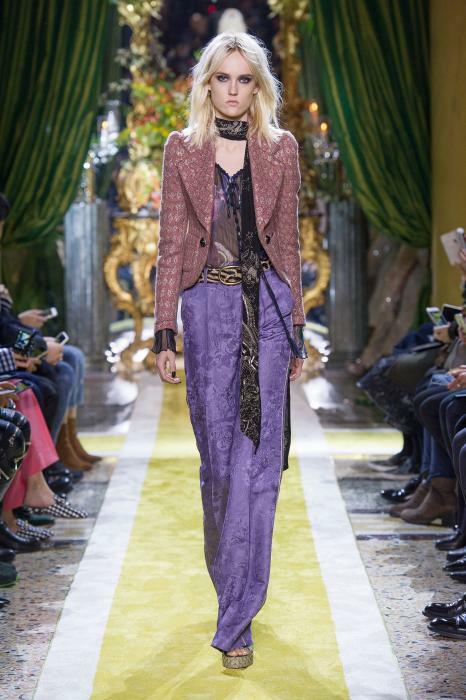 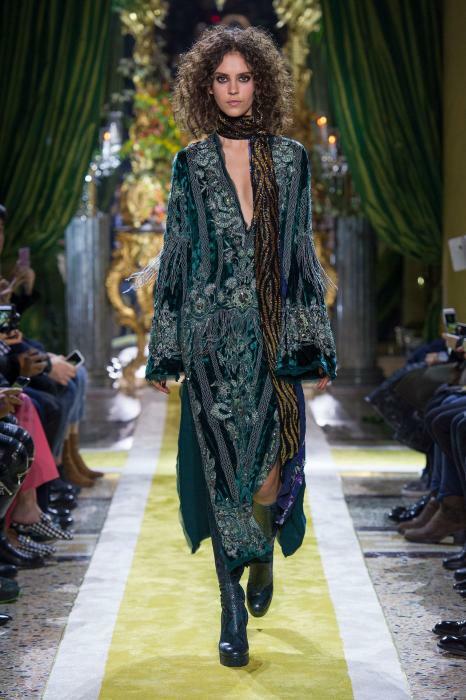 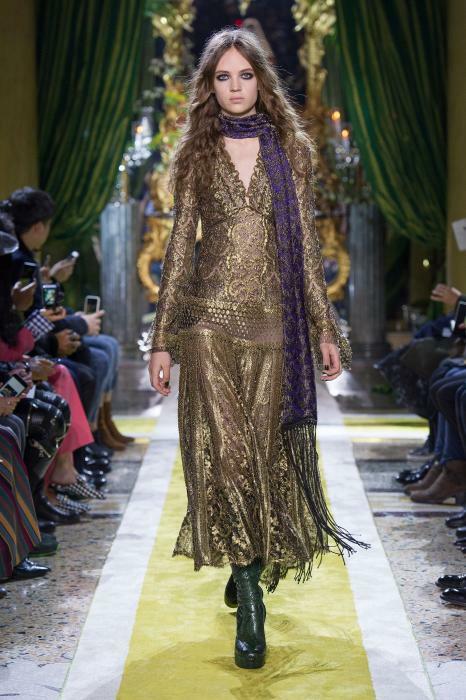 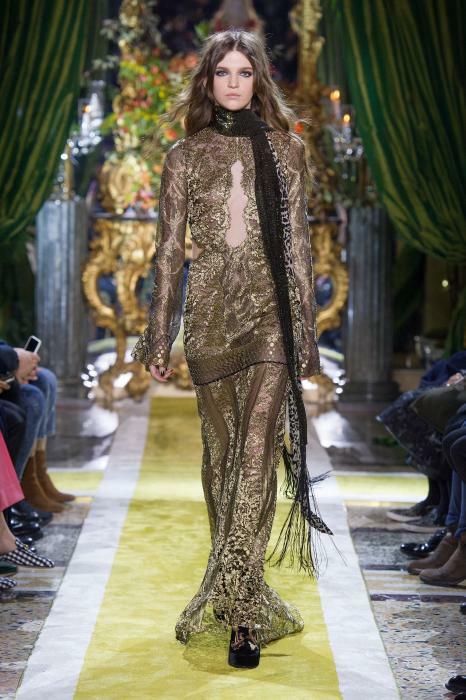 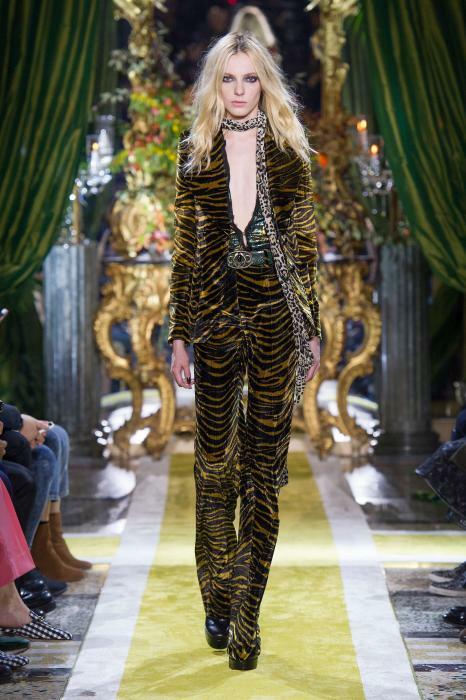 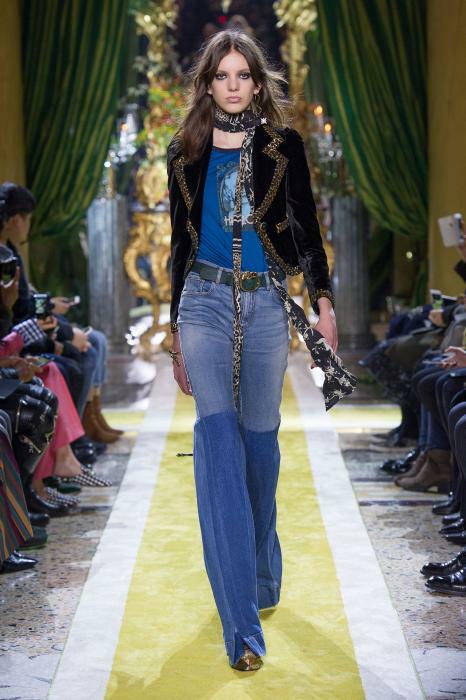 Roberto Cavalli Fall 2016 ready-to-wear collection was royal and extravagant! 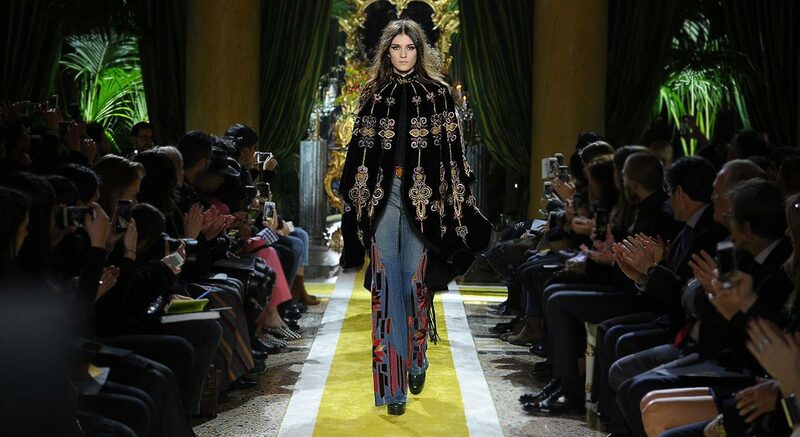 See all the looks, backstage moments and discover our favorite looks. 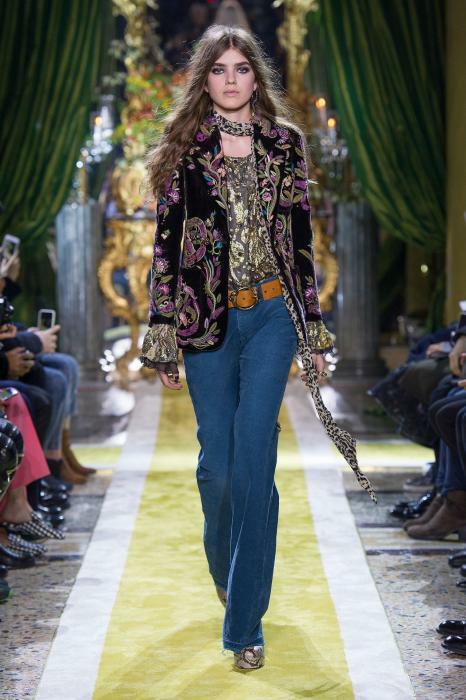 The collection draws its inspiration from a few vastly different sources, but manages to fuse them together in a seamless, tasteful wardrobe. 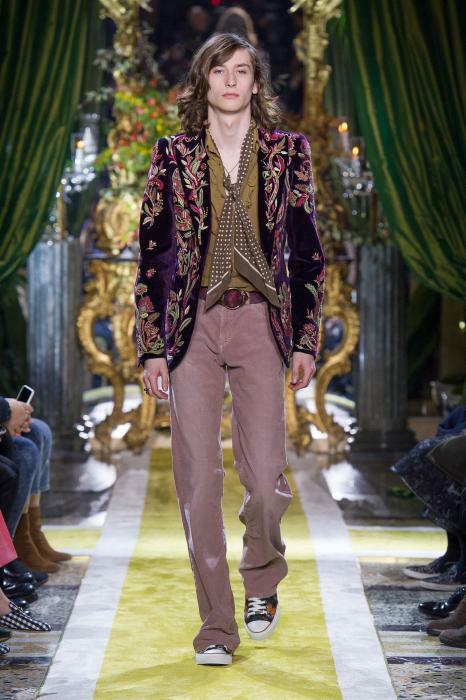 Two major inspirations are art nouveau and glam rock. 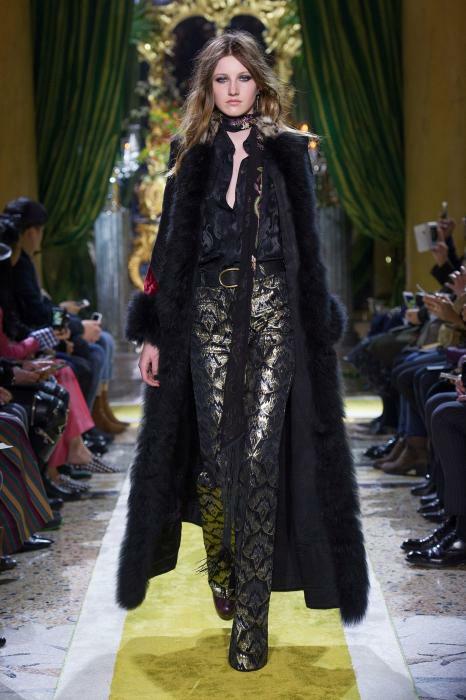 The fashion show is held in an open hall, not auditorium-style, but like a large gallery, with audience seated in many parallel rows of seats placed back to back, such that nearly half of them are in the front-row! 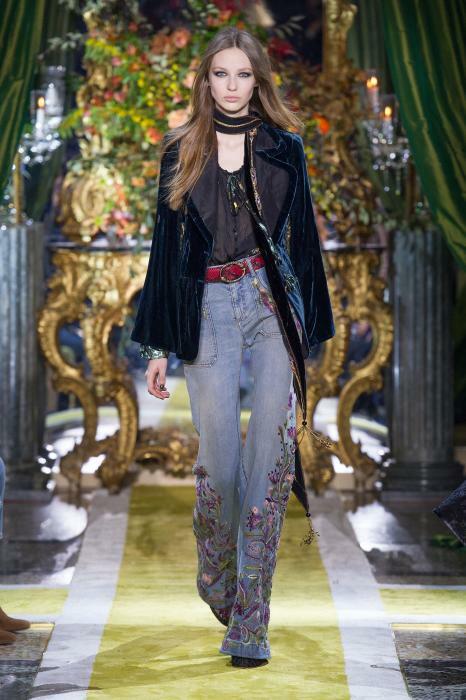 A backdrop of a large mirror with an ornate, art nouveau style frame and matching center table forms the backdrop of the models. 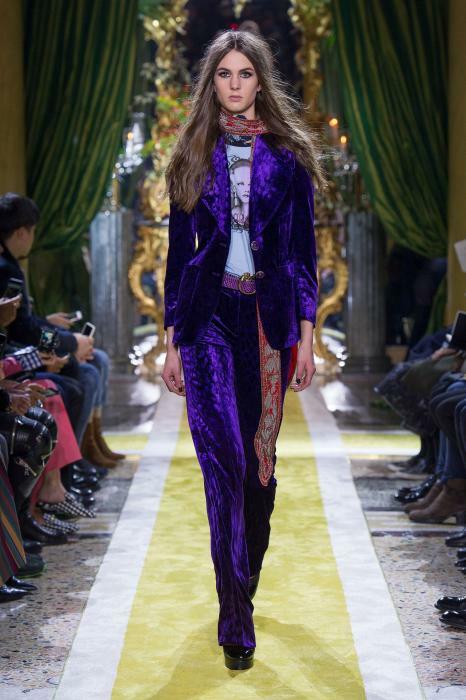 So yes, it’s glam rock, but for a tasteful woman with a rich lifestyle. 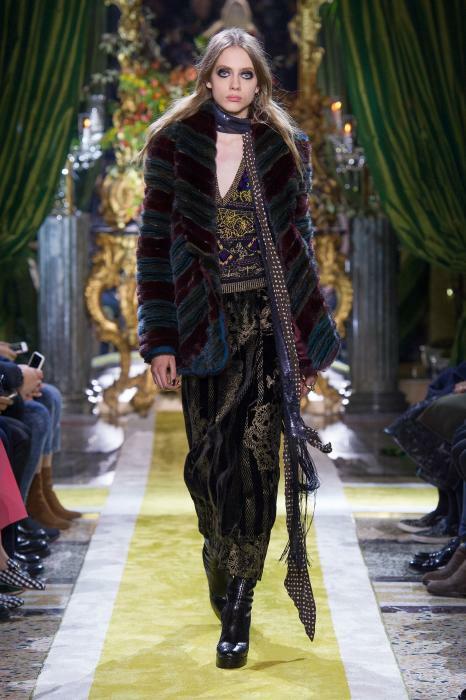 Someone who appreciates cultural savoir faire, art and history as much as the modern-day life. 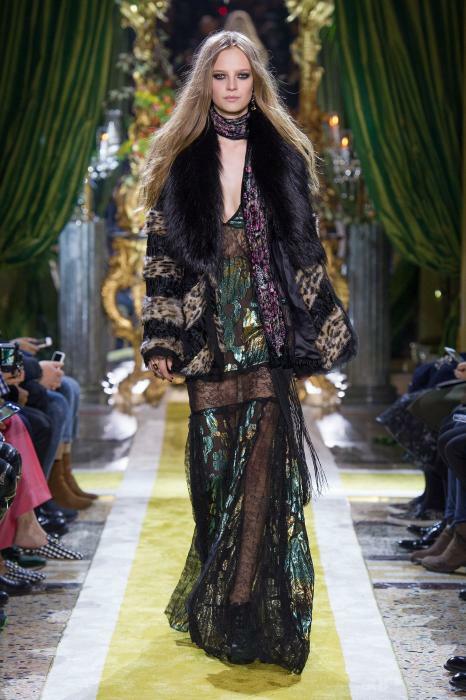 As the fashion show description mentions, a collection with “a dégagé ease” for the “nocturnal adventuresses”, or party lovers, in other words! 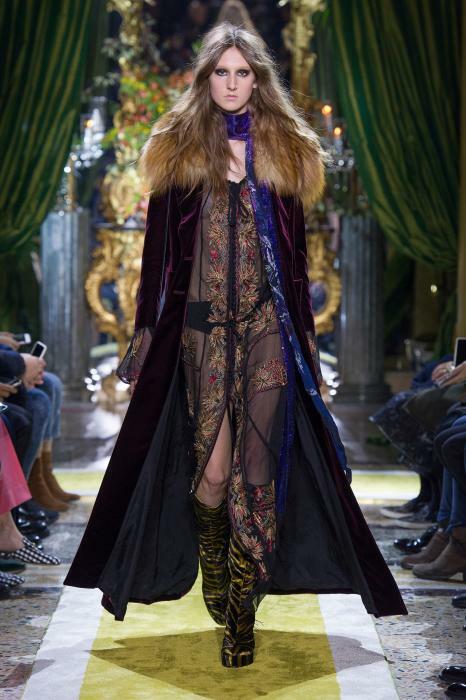 The pieces included coats, robes and capes, dresses and gowns, and mostly jackets, shirts and skinny scarves. 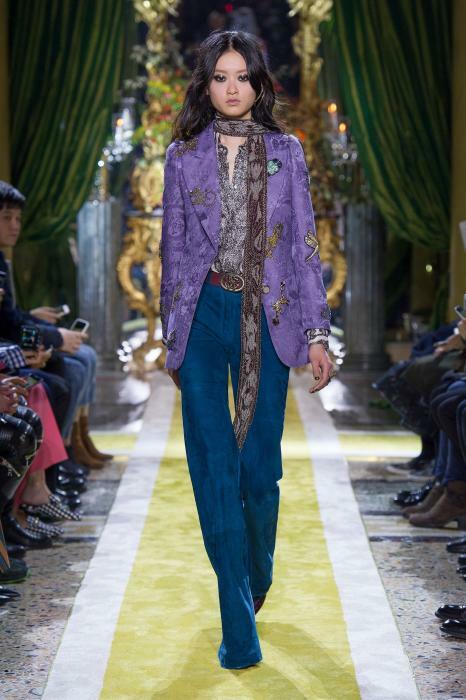 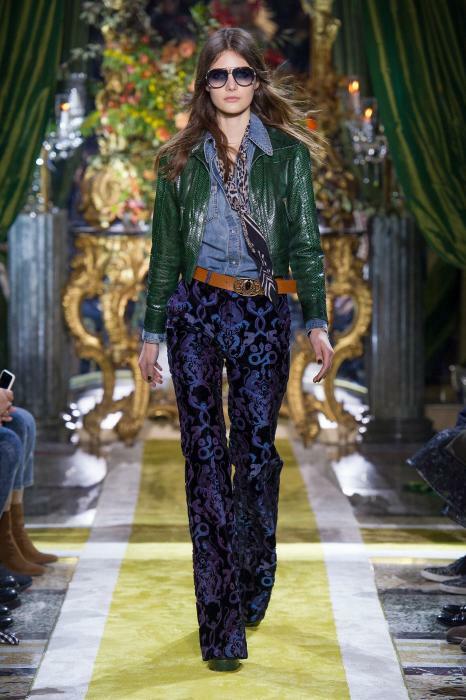 With bell-sleeves and flared pants, the collection seemed to evoke the pleasure of the late sixties. 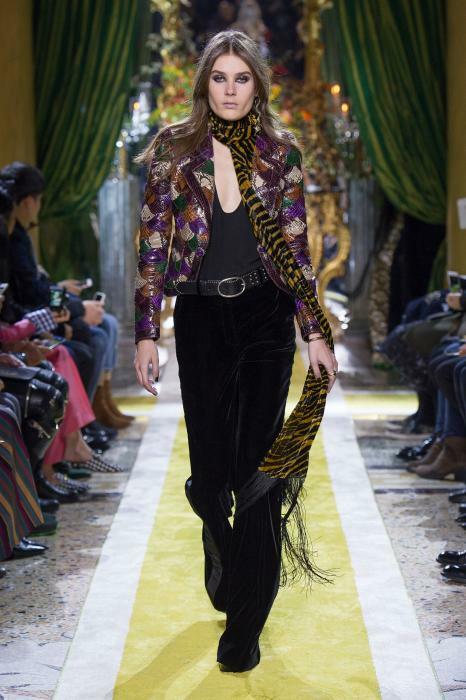 Along with animal print, sheen, neck-scarves and long velvet jackets. 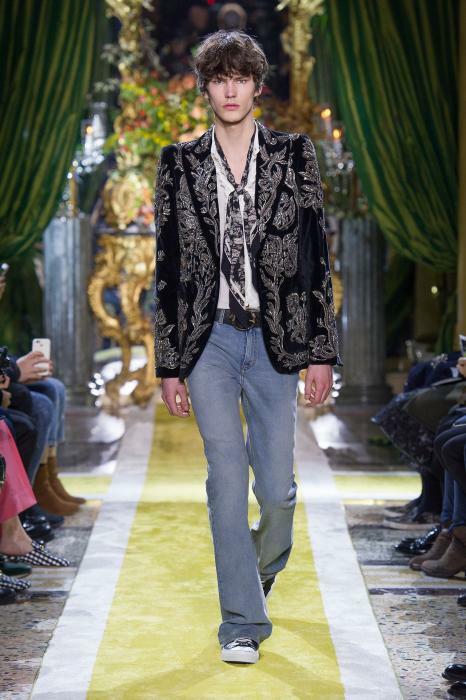 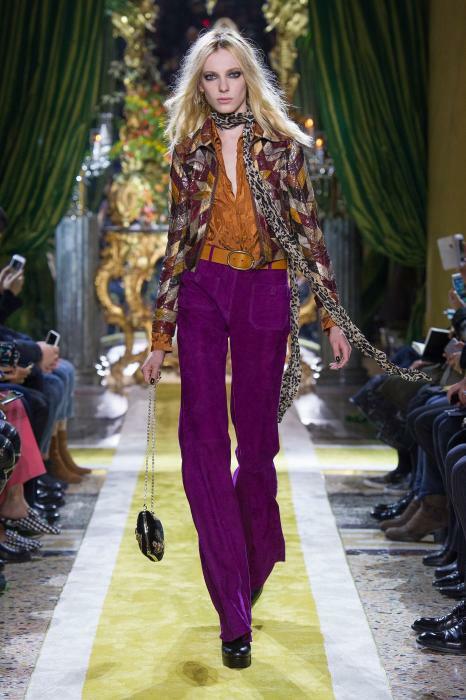 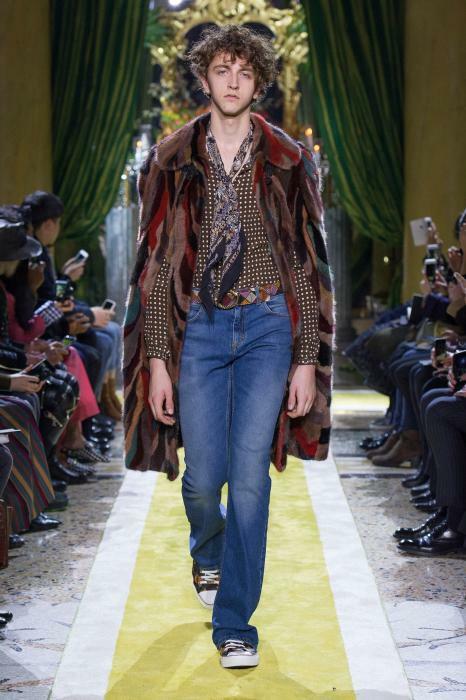 Roberto Cavalli’s Creative Director, Peter Dundas plays on androgyny as much as it does on sensuous femininity. 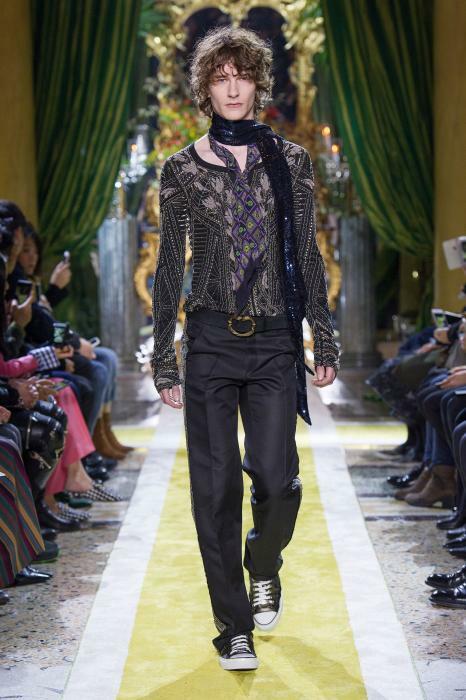 Skinny zebra-print scarves, 60s style flared pants and shirts are paired the same way, to be mixed and matched for men as for women. 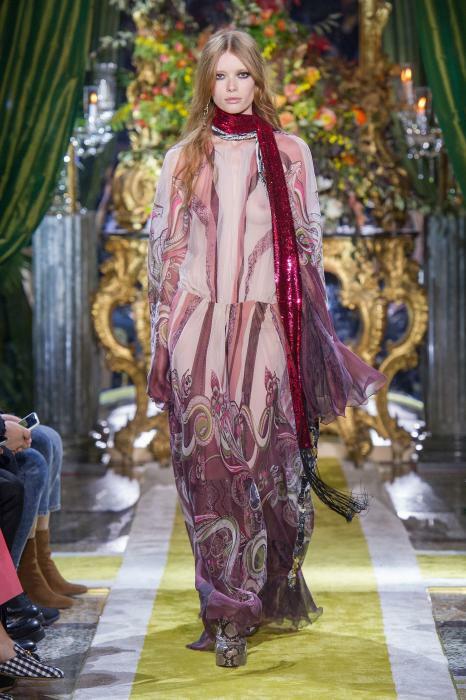 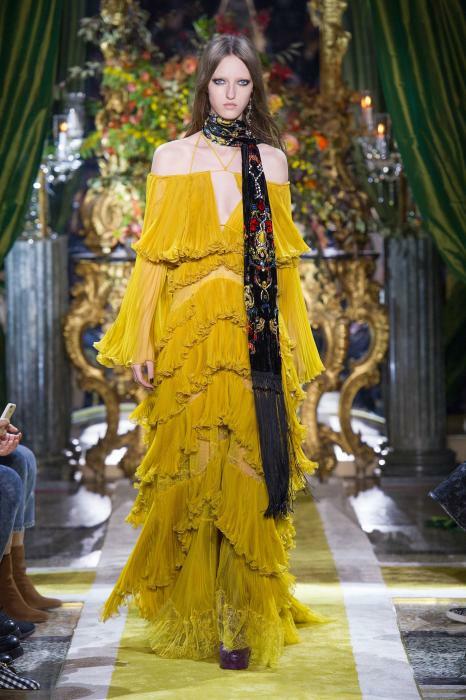 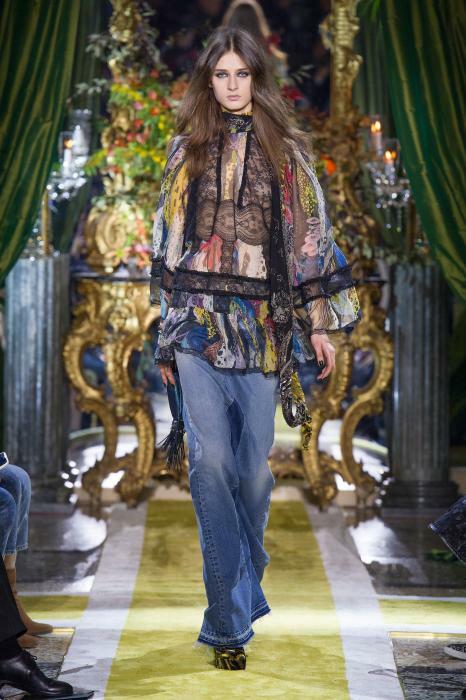 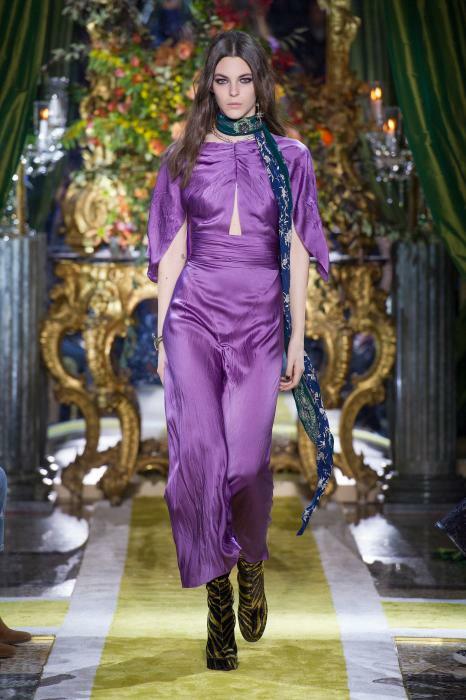 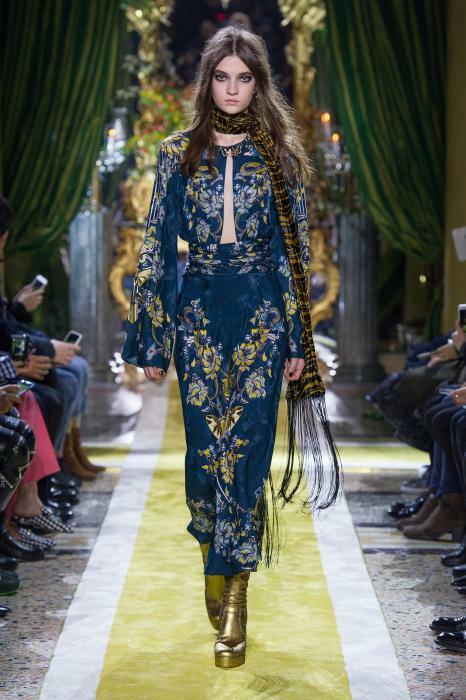 The art nouveau richness brought with it fabrics like velvet, lace, brocade, fur and silk. 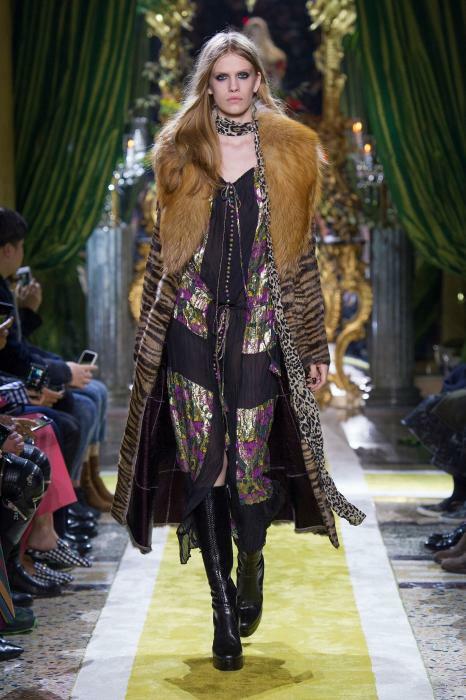 Decorative patterns mixed with head-to-toe tiger prints in some, or nature-inspired embroidery in others inspired by the work of René Lalique, with ornamentation on lace dresses and jackets. 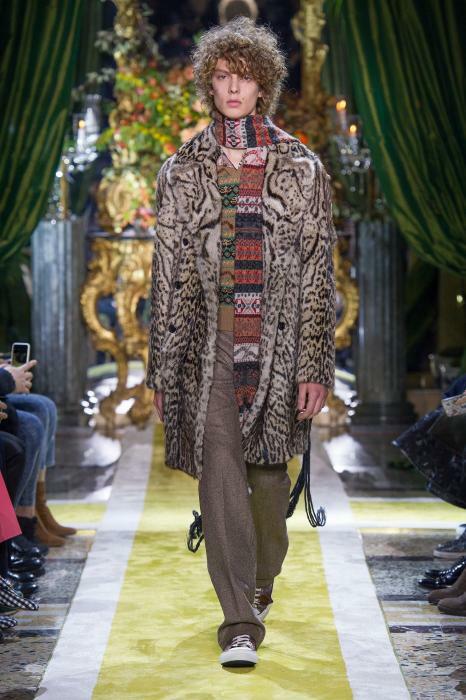 Some had hussar frogging, while some others used patchwork. 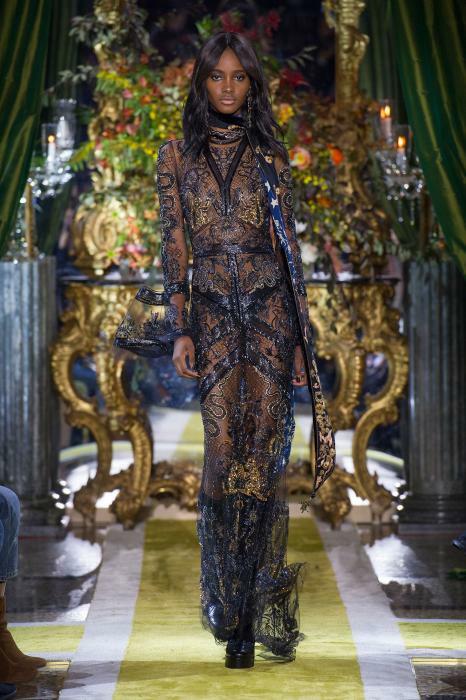 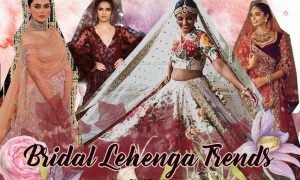 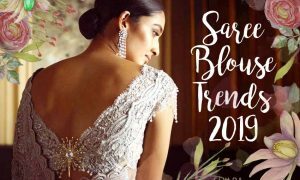 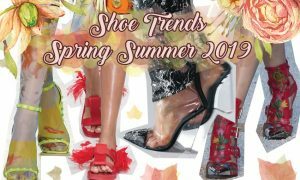 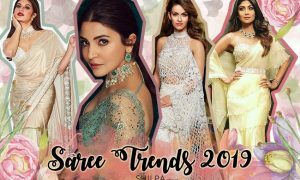 The silhouettes covered the models neck-to-toe in fabric, but not without showing skin through decadent lace, mid-body cut-outs and sheer georgettes. 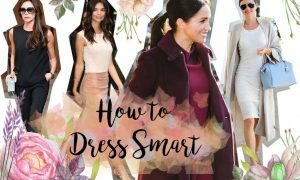 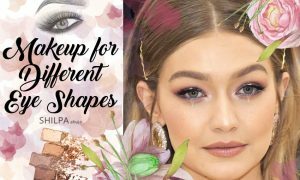 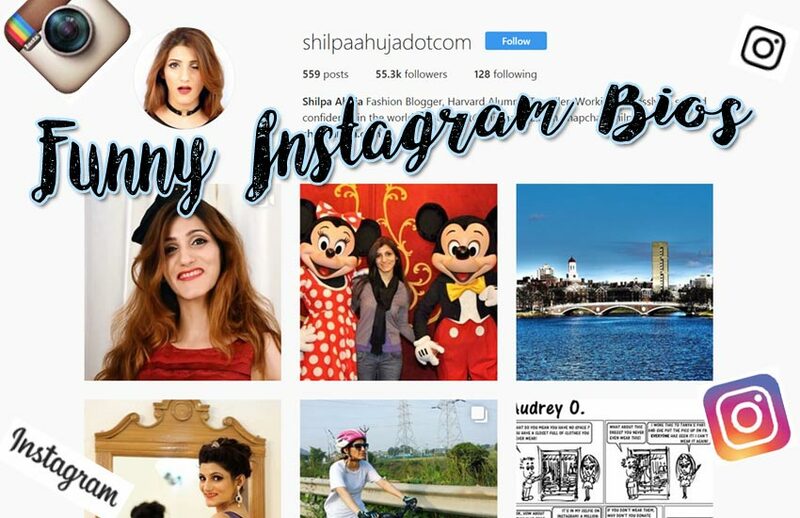 The color palette was new – mid-hues like deep-sea blue, tan and purple, mixed with royal colors like burnished gold, lavender, grape, scarlet and robin’s egg blue with some black and it’s side-tones. 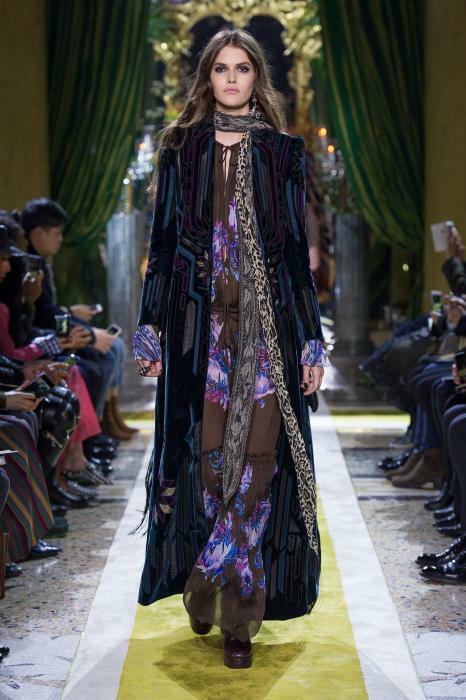 My favorite outfit has to be the embroidered cape paired with flared denims (shown above) and a lace maxi gown worn with a floor-touching robe with broad fur trimmings in grape. 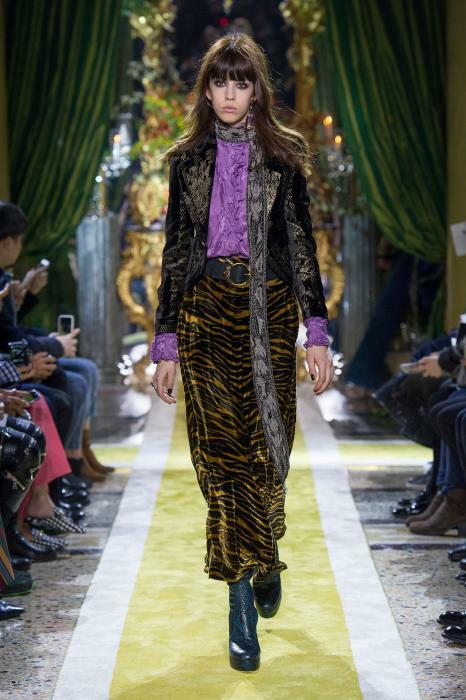 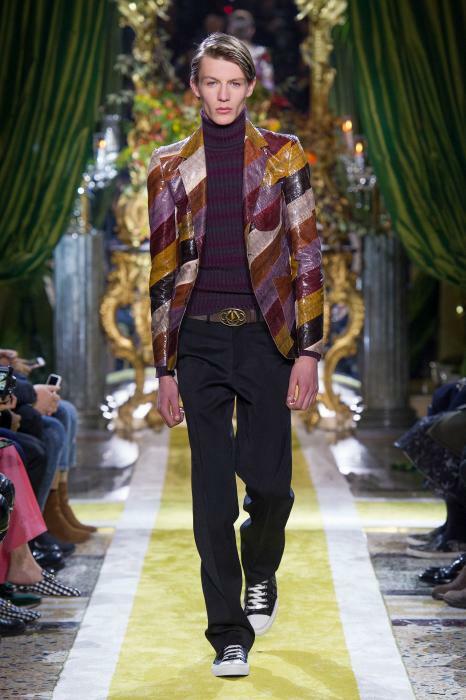 I especially adored all the jackets, and a pair of burnished gold flared pants worn with brocade jacket and scarf – an outfit that’s very shiny and certainly not for everyone! 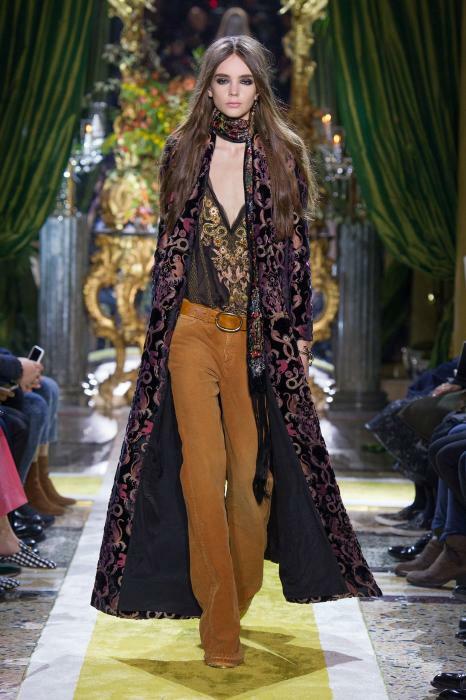 But then, so is fashion.